Should there still be a capacitor somewhere in the speaker circuit? 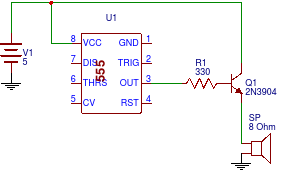 An actual circuit based on this schematic does work (and the volume of the speaker is indeed louder), but the transistor gets warm. Could the transistor operate at a lower temperature and could the same speaker produce a louder volume by the introduction of a capacitor? If so, where? Would it be between the junction of R1 and Q1 and ground? And because the impedance seen by such a capacitor would be more heavily influenced by R1 than by Q1, and thus close to 330 ohms, would it be reasonable that its value would be significantly lower than the 100uf in the circuit without the amplifier (where the impedance is around 8 ohms)? Missing Health App at watch! How do I clean my bands to make them look new and white?